The Chainsmokers’ latest song, Sick Boy, sums it up in a line, How many likes is my life worth? Constant interruption, desire to be entertained twenty-four seven, and continued connectedness are taking a toll on our mental, physical, and emotional health. There is now a wide body of evidence that points to the fact that heavy use of smartphones, internet, and many social media platforms can have debilitating effects on our neural processing, cognitive performance, and behavior. On average smartphone users check their phone close to 85 times a day and interact with their phone about five hours a day. Increasing evidence is pointing to the fact that our smartphones are not making us so smart after all and are leading us to more unhappiness. A novel study by Adrain F. Ward and colleagues found that the mere presence of a smartphone induces a “brain drain,” a disruption that limits one’s ability to participate in the present moment. This reduces cognitive capacity for the task at hand by increasing an attentional shift toward the smartphone. This process is exhausting, and that is exactly how our brain feels as it wastes energy. So, when you are at a lunch date, dinner, business meeting, or engaged in a conversation, have your phone out of sight so you can focus on the present moment. Engage your attention in a single task, paying attention to the person right in front of you. 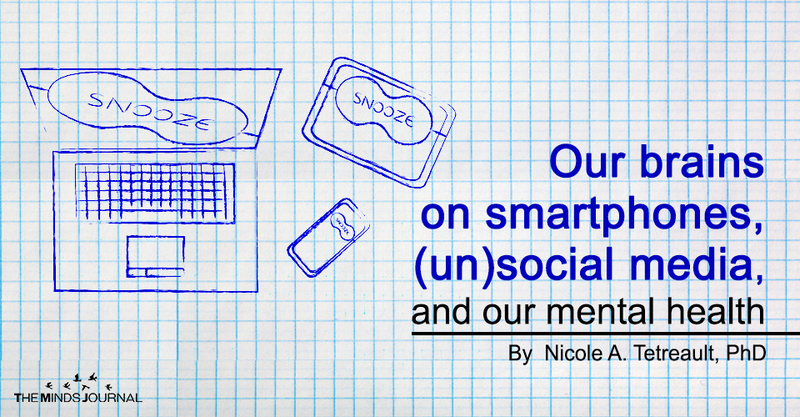 Not only do smartphones hog our attention but they impair our learning and memory. Interestingly, a study found that too much media multitasking causes a cognitive overload, which interferes with learning. Heavy multimedia users were more distracted and did not perform attentional tasks as well compared to light multimedia users. Unfortunately, more often than not, the loudest thing gets our attention. Our smartphones can create infinite distractions that can alter our cognition, behavior, and performance. Heavy smartphone users experience greater impulsivity, hyperactivity, and negative social concern, as reported in a study conducted by Aviad Hadar and colleagues. Additionally, heavy smartphone users showed greater difficulty with number processing and reported greater inattention. This could explain why many of us feel depleted and have difficulty remaining on task. Unfortunately, people who use many social media platforms feel increased anxiety and depression. And a new study found that 75% of people do not want to see their “friend’s” vacation photos on social media. So, what is happening? Connectedness and being social is getting lost in translation. We have entered the new divine age of keeping up with The Jetsons. Basically, following friends on social media created increased envy, depression, and negative mood in college students. When the social validation does not happen, or we are rejected on social media, our brain hurts, we experience emotional pain, and this effects our mental health and well-being. Overuse of smartphones and many social media platforms has major consequences for health, life satisfaction, meaning, and happiness.